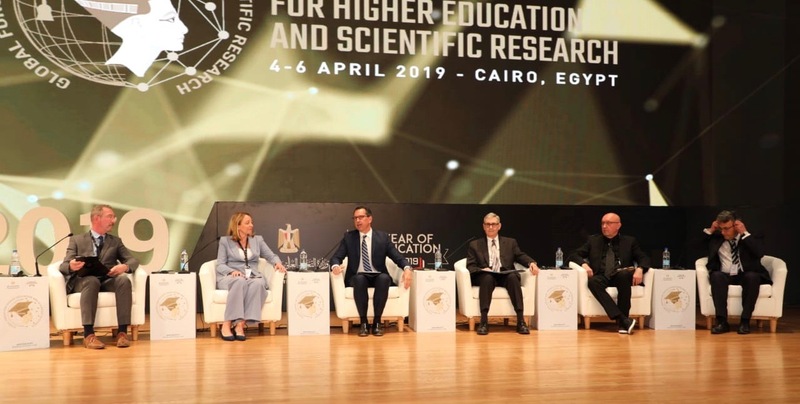 From April 4-6, 2019 GDTA president and HPI D-School Director Prof. Uli Weinberg travelled to Cairo to attend the first Global Forum on Higher Education and Scientific Research. He followed the invitation of the Egyptian Minister of Higher Education and Scientific Research, Khaled Abdel Ghaffar. The GFHS conference and exhibition was bringing together more than 5.000 international leaders from the fields of scientific research, innovation, higher education and politics. The conference aimed at envisioning the next ten years of higher education and research in a global, networked world. Together with A. Trey Traviesa, Chairman and CEO at MGT Consulting Group; John C. Cavanaugh, President and CEO of the Consortium of Universities of the Washington Metropolitan Area; Carita Prokki, Director at Tampere University of Applied Sciences; Matthias Knaut, Vice-President for Research at the HTW Berlin; and Luciano Saso, Professor at the Faculty of Pharmacy and Medicine at Sapienza University of Rome, Uli Weinberg was part of a panel discussion on the “Future of Universities”. During the discussion, he presented the HPI School of Design Thinking as a prototype for learning environments in the 21st century. There was agreement on the panel about the necessity to fundamentally rethink the academic system in the times of digital change. Global Forum on Higher Education and Scientific Research, Cairo, Egypt from Uli Weinberg on Vimeo. After the conference, Uli Weinberg also visited the American University in Cairo (AUC) which has been a network partner of the HPI D-School since June 2018. On AUC campus, he met with Hoda Mostafa, Associate Professor and Director of the Center for Learning and Teaching, and her team. He gave a spontaneous input to the participants of a Design Thinking bootcamp that had just started in cooperation with the Clothing Bank. The AUC, a leading English-language, American-accredited institution of higher education, is currently planning a learning innovation center. There it and aims to establish the first Design Thinking school in Egypt. AUC American University in Cairo from Uli Weinberg on Vimeo.